Co-opting blue collar culture in the name of irony is nothing new. 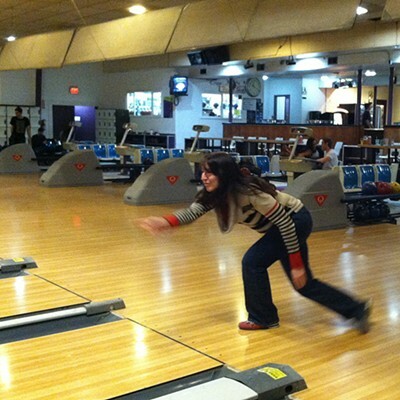 Head up to Portland or over to Brooklyn and you'll find numerous bowling alleys brimming with floppy-haired 20-somethings striking poses in carefully wound scarves and too-small cardigans. In these parts, things are -- unsurprisingly -- different. We laugh without inhibition. We are sincere in our appreciation of inexpensive, all-ages entertainment. 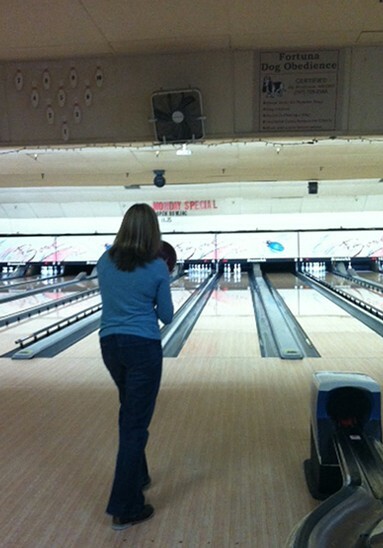 In Humboldt, it turns out, we still bowl just for fun. So the night ended around 11 p.m. with tattooed butts in the bathroom. Things started on a more conventional note, however, with drinks and a bowl of chili at the Jambalaya. 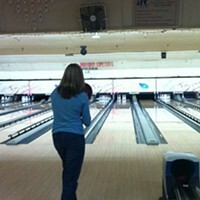 We mentioned to our bartender, Colleen Terry, that we were heading out to the Blue Lake bowling alley. She lit up. "I used to bowl every week -- E&O is the best!" Intrigued, we hit her up for some tips. "You have to know how to score your own card," Terry said, as E&O doesnʼt do digital, "which is awesome." "How do you know what ball to pick?" I asked. "You should go as heavy as you can go," she advised. Terry lifted her hands as if picking up a bowling ball. "You know," she said. "And do some practice frames. Oh, and donʼt wear thumb rings! I did that once. It wasnʼt good." E&O sits next to Murphyʼs market and not much else. Walk in and to the right is the bar, to the left are the lanes, in the back stands a jukebox, an air hockey table and some arcade games. Centrally located is your shoe rental and a row of pool tables, which were dominated by kids shoulder-high to me who knocked balls into pockets like theyʼd been born to it. When Iʼd phoned to ask about coming in, the woman who answered called me "hon." The place is timeless, which is what I think we call places that appear to be almost exactly the same as when they ﬁrst opened decades prior. Important note: Somewhere in our house, despite my decluttering efforts, a 1970s-era bowling shirt full of patches and pins is taking up space. That night at the E&O, my husband relived some of his former glory days. Not that the rest of us (and by "us," I mean the people who were "not me") werenʼt solid, too. But at some point, we decided to play teams and faced the problem of an odd number of players. The solution: Make Bobby play on both teams. "Our Bobby is better than your Bobby," our friend Matthew Marshall crowed a few times. Bobby balanced things out, totaling 131 for their team and 135 for ours. Unfortunately for him, anchoring both teams and having to keep score meant he had no time to pick out songs on the jukebox or order drinks. Instead he had to keep tracking down his errant teammates: "Hey! Itʼs your turn!" Lesson learned: Sometimes itʼs better to be third best. Handing out shoes -- and advice when asked -- was Sean Buskirk, whoʼs worked for E&O for eight years now. Originally from Eureka, Buskirk gave us the brief overview of the business. "We get a lot of college kids, families on the weekends. Things are pretty steady in the winter. Summers are slow. 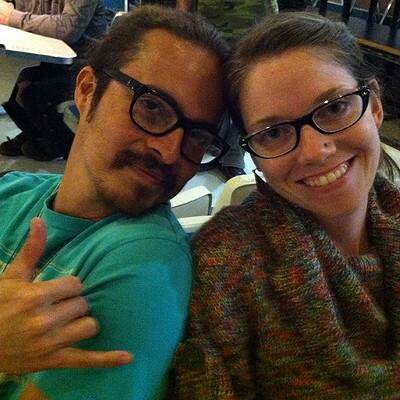 Kind of took a dive for a while, but weʼve been busier lately." What should ﬁrst-timers know before showing up? "Call ahead to make a reservation, have cash on hand because we donʼt take cards and neither does the bar, and be prepared to have a good time." "Do people make a lot of Big Lebowski references?" I asked. Before this evening, my E&O experiences had been limited to the annual Arcata Eye Ball soirée, when "Arcata hippies" would take over the joint to the consternation of the barʼs regulars. It was those regulars who ﬁlled my imagination when I pictured what we would be getting ourselves into. Think crusty. Think grizzled. Think cranky. "So itʼs more hickster than hipster?" my pal Jessica Hall asked when I described my view of the place. Exactly. Except I was wrong! Oh, sure, a fellow or two couldʼve been described fairly as "rough." But the truth was, the patrons didnʼt have all that much in common on the surface other than an enjoyment of throwing balls at pins and an enthusiastic response when I put "American Girl" on the jukebox. The jukebox, by the way, has some good stuff (Tom Petty, ZZ Top) and some bad stuff (Mötley Crüe). It also has a high percentage of pop/hip-hop/top hits compilations. I am unsure how the music was curated, but hey, when you can hear "Cheap Sunglasses" followed by "Hey, Ya," itʼs all right all right all right. "Georgia bands are dominating the jukebox!" enthused fellow bowler Claire Reynolds, and sure enough, the Deep South vibe continued as someone in the bowling alley actually paid for and picked out, "Free Bird." So, yeah. The young and beautiful people next to us didnʼt seem fazed by the music one way or another. I was surprised by them, though, since I hadnʼt expected to see anyone younger than 35 unless they were dragged along by their parents. week," Southard said. "Itʼs the only thing to do as far as activities for a lot of my friends who are underage." Itʼs really hard to get everyone out to E&O, she continued, "but everyone always has fun when they do." Jeff Kinzer, 31, was more direct with his disdain for my mistaken impression that only middle-aged folks and up would populate the lanes. "Bowling is for everyone!" Not everyone so eagerly claims the game, however. When I first asked new friend Matthew if he bowled much, he hedged, but finally admitted he owned his own bowling shoes. In my book, that makes him bona ﬁde. So I asked him for some advice. "Rule number one," he said, "bowl straight." "What do you mean?" I interrupted. "Like not into the gutters?" This seemed a little too dumbed-down. "Like, donʼt prance around and act goofy," he clariﬁed. "Just bowl." Oh, OK. Got it. "Next rule?" Matthew looked square in my eyes. "Rule number two: Stop bowling stupid." I wish I could say that my game immediately improved. It did not. But the fun times escalated unexpectedly with, er, a trip to the bathroom. I started to open the door only to have it bash into a group of giggling girls. I could neither enter nor make out what was happening, so I retreated to the bar, then bowled another frame before skipping back up to the loo. This time, the bathroom was empty, so I ducked into a stall, one which, I discovered, had no latch. This was a problem when moments later the posse of women returned and one of them pulled open the door before I could holler, "Hey!" She immediately slammed it and collapsed into her friends. "Oh my God, itʼs that same girl! She must think weʼre trying to assault her!" she laughed. I exited the stall, washed my hands and confronted the guffawing foursome. They explained that they were buying temporary tattoos from the vending machine and applying them to their asses, then taking photos to send their boyfriends. "This is great," I enthused. "By the way, Iʼm writing a story for the North Coast Journal ... "
Screams and laughter. "You cannot put us in the paper!" And then, "Hey, are you Jen Savage from Surfrider?" "Iʼve been admiring what you do for years!" "Well, thanks. I am admiring what you are doing right now." "You should totally do a tattoo and take photos with us!" Hmmm. "If I do, I have to write about it." Screams and laughter. "Youʼre only 50 cents away!" And that is how Claire ended up standing on the sink of the E&O bathroom documenting four temporarily tattooed booties with one tramp-stamped-for-the-moment me. Lesson learned: Thereʼs more than one way to win at the lanes. Sunday afternoon came around like springtime, daffodils blooming, sun shining -- and an icy north wind discouraging any ideas about strolling around outside. Might as well go bowling, I thought, and called up my friend Peri Escarda. She grew up in Eureka, right across from what was then Broadway Lanes -- which should have prepared me for the drubbing I was about to take. Also along, Periʼs daughter Dezi, 14, a dancer who hadnʼt bowled before. My own memories of Harbor Lanes consisted of attending childrenʼs birthday parties when my kids attended Ridgewood Elementary, of hosting a birthday party there when my son turned 6 -- we still have the signed token bowling pin -- and walking in shortly after 9/11 to see T-shirts for sale adorned with Osama bin Laden in crosshairs. 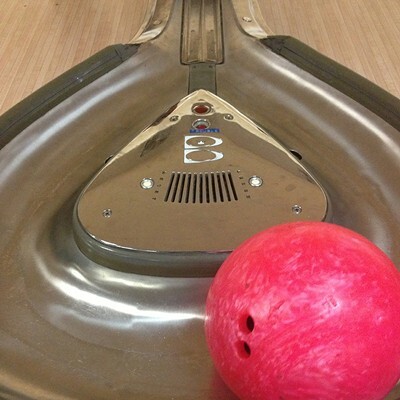 Those are long gone, but bowling supplies can be found in the Harbor Lanesʼ Pro Shop, one of the details that sets the Eureka venue apart from its Glendale cousin. Additional amenities include taking credit/debit cards, a diner and a photo booth -- but no air hockey. We walked up to the "control counter" and asked for shoes. They were provided. We gathered them up and walked toward the steps leading down to the lanes. "Where are you going?" the clerk called, laughing. "We donʼt know what weʼre doing," I stated the obvious. "Well, youʼll need a lane," he drawled. "And I can give you 25 and 26 for free." He laughed again. "Yeah, but we only have 24 lanes!" Eventually we were given a "light" ball, bright pink, and assigned to lane seven. I took charge of the monitor, which still showed scores from the previous gameʼs players. This is really important. Remember this: The monitor still showed scores from the previous gameʼs players. I cleared the screen, set us up, got going. Peri immediately knocked down nine of the 10 pins on her ﬁrst roll. When her daughter stood up to take her turn, Peri walked her through the motions, advising, "Donʼt look at the pins; look at the arrows [marked in the lane]." All around us, people ﬁlled the bowling alley. A mom, her daughter and their friend owned the lane next to us. A birthday party erupted behind us. A hefty man in a white T-shirt bowled strike after strike a few lanes down, to the cheers of his friends and family. 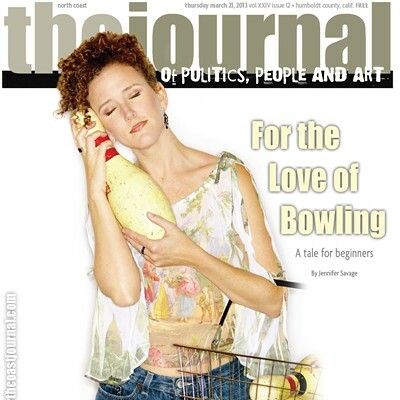 A couple of women in bowling shirts shrieked every few moments, whether from appreciation or disgust, I wasnʼt sure. The smell of French fry grease wafted by. Following earlier advice, Iʼd picked a 12 pound ball. I was hitting more pins than not, but by the ﬁfth frame the strain in my arm reminded me of lifting weights. I switched to a 10 pound and found myself doing much better. My strategy was to toss that ball hard on the ﬁrst go, counting on the velocity to keep the ball on track and demolish what pins I could, then on the second throw hold back a bit, counting on slightly better aim to take out what remaining pins I could. I ended with an 87, which I think is not terrible, so apparently my plan worked. Or I got lucky. With bowling, itʼs hard to tell. But while my score made me happy, the number wasnʼt all that important. Laughing with friends and the fun of playing was enough. Sheri Schlesinger, the mom in the lane next to us, agreed. "Itʼs something fun to do," she said. Her friend, Vicki King, elaborated. "Itʼs something you can do at any skill level, any age." When asked what advice sheʼd give ﬁrst-timers, Schlesinger recommended being patient with yourself -- "and ask for an eight pound ball!" Her daughter, Breann Davis, 16, added that the Friday night "Rock and Roll Bowl" usually attracted plenty of teenagers, one of the few options available to the under-21 crowd. The only sour notes came when I went to ﬁnd water -- Styrofoam cups? Really? -- and when we went to pay for our games. Three people, two games, three pairs of shoes, should be about $22.50, I ﬁgured. At the counter, the woman working announced the total as $56. "Says you played 20 games," she said. Now, to play 20 games would take several hours at best. And who plays 20 games in a row anyway? The fact an error existed seemed clear. Solving the problem took a surprisingly long time and ﬁrm stance on our part, but after some back-and-forth we worked things out. The glitch? We hadnʼt had the staff come to clear the scores from the previous game. Lesson learned: Ask about everything in advance, lest you get stuck paying for 18 games you didnʼt play.